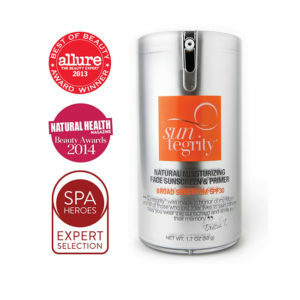 Suntegrity’s SPF 30 Natural Mineral Sunscreen for the body offers broad-spectrum protection and is free of harsh chemicals like parabens, phthalates, propylene glycol, mineral oil, synthetic dyes, sulfates, nanoparticles and chemical UV absorbers. 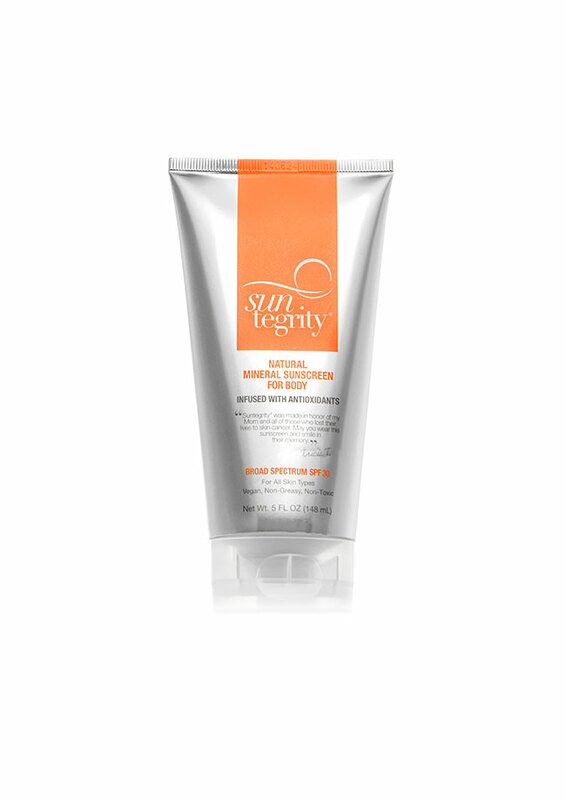 It's non-greasy and contains 20% non-nano, uncoated zinc-oxide for therapeutic broad-spectrum protection against the sun’s harmful UVA and UVB rays. This sunscreen formula is easy to apply, loaded with antioxidants for healthy protection all year round and has a light uplifting citrus scent. TSA Friendly. Made in the USA. Featured in the “Best Sunscreens” Category with a #1 Rating in the EWG’s 2013, 2014, 2015 and 2016 Sunscreen Guides. UV Chemical-Free Sunscreen Broad Spectrum Protection Paraben, Phthalate and Mineral Oil Free Cruelty Free and Vegan Non Greasy for Smooth Application Contains Organic Ingredients like Green Tea Extract, Cucumber Extract, and Pomegranate Seed Oil for added protection. Active Ingredients: 20% Zinc-Oxide Inactive Ingredients (listed in alphabetical order per the new FDA sunscreen monograph): Aloe Barbadensis (Organic Aloe Vera) Leaf Juice, Camellia Sinensis (Organic Green Tea) Leaf Extract, Caprylic Capric Triglycerides (Coconut Oil Extract), Cetyl Dimethicone (Mineral Based), Citrus Aurantium Dulcis (Sweet Orange) Essential Oil, Citrus Grandis (Grapefruit) Essential Oil, Citrus Reticulata Blanco (Tangerine) Essential Oil, Cucumis Sativus (Organic Cucumber) Fruit Extract, Ethylhexylglycerin (Plant Derived Preservative), Glyceryl Monostearate (Plant Derived), Helianthus Annuus (Organic Sunflower) Seed Oil, Hexyl Laurate (Plant Derived), Hyaluronic Acid (Plant Derived), Magnesium Sulfate (Epsom Salt), Polyaminopropyl Biguanide (Preservative), Polyglyceryl-4 Isostearate (Plant Derived), Punica Granatum (Organic Pomegranate) Seed Oil, Simmondsia Chinensis (Organic Jojoba) Seed Oil, Sorbitan Stearate (Plant Derived), Water (Aqua). NOTE ABOUT ESSENTIAL OILS USED: Suntegrity scented sunscreens use a very low dilution of essentials oils (less than 1/2 a percent for scent purposes only) together with 20% zinc oxide as a sunscreen. We have performed RIPT (Repeat Insult Patch Test) testing through an outside lab (BioScreen) using a 50 person panel showing no contact irritation or sensitization to our sunscreens. This test allows us to make the claim: Non-Irritating, Allergy Tested and Clinically Tested. If you prefer no essential oils in your product, the tinted face sunscreens and the unscented body sunscreen do not contain essential oils.